A lock that is fitted into a mortise in the edge of a door rather than fixed to the door surface. The spring loaded bolt that performs the functions of a latch and also a bolt. It has a bevelled face pointing to the closed position. The distance from the edge of the door to the centreline of the cylinder and or the spindle. An internal feature of some mortice locks to enable the latchbolt to held in the retracted position. 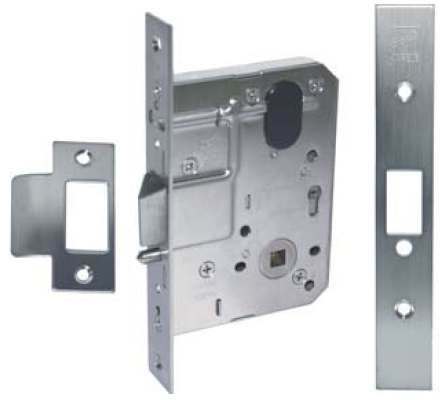 Heavy Duty Mortise Lock : Image provided by Hafele Australia Pty. Ltd. Above a typical quality mortice lock. From left to right is the strike plate, the body of the lock and the Forend. It has a standard backset of 60mm and the strike plate and forend are in satin finish stainless steel but there are other options available. 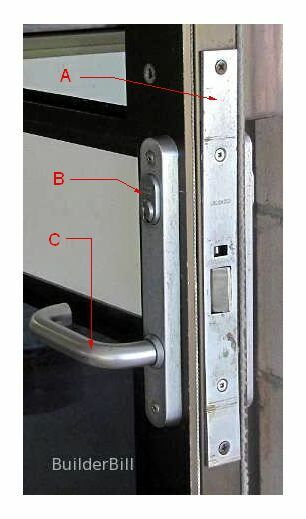 Locks like this are designed for use on commercial doors, security doors and in heavy duty applications like schools and hospitals where the doors have to be fire resistant. The Latch Bolt Is reversible for left or right opening doors and this can be done without disassembly of the lock. I shouldn't show my age here but I wish I could get back all the time I have wasted in the past messing about with locks in pieces or looking for lost springs. It can be fitted in doors from 32mm to 50mm thickness. It has a Holdback feature. Suitable for use with electric strikes. Door Locks : A modern mortice lock. A is the Faceplate or the Forend. As mentioned previously they are teamed up with the strikes for different styles but the basic lock remains the same. B is a removable Cylinder that uses a key to activate the locking action of the latchbolt. C is a Lever Handle that is attached to a Spindle that activates the latch action of the lock. We are looking at the inside of the door, so it has a lock cylinder inside and outside. The inside lever handle will provide an escape function for the fire regulations. Knobs can not be used in this instance. The door to the right gets a lot of traffic so the Holdback feature is being used. The latchbolt is retracted so that the door can be pushed and pulled open without levering the handles. Modern aluminium framed doors are very hardware friendly. The extrusions are well designed to enable the fitting of hardware like locks and flush bolts. The fact that the sections are hollow makes mortice locks the favourite by far. The lock manufacturers in their turn produce lines of mortice locks that fit into various popular door sections. Narrow stiles like the one shown here mandate the use of lever handles and there is a huge range to choose from. 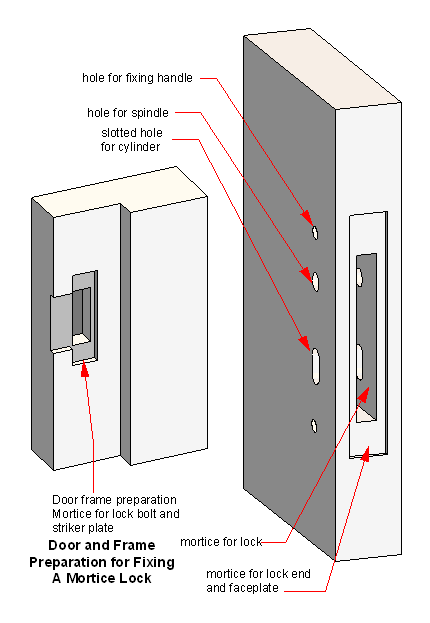 Mortise Lock : A sketch of the preparation work required for fixing a mortice lock. The sketch here shows the joiner's work in preparing the door and the the door frame ready for fixing the lock. Fixing locks like this requires a fair bit of skill and it is not a job that can be rushed. The measurements have to be very accurate as a small discrepancy can affect the good functioning of the lock. The lock manufactures supply various jigs for fixing these types of locks and anyone who has many of them to fix would find them a valuable investment. I have never used jigs for this sort of work, preferring to use electric drills and chisels. I must admit though that I have come perilously close to taking the drill point through the face of the door when drilling for the mortise. The trend is for thinner and cheaper doors and the thinner the door the more neat and accurate the mortice has to be as there is little tolerance. Chain morticer types of machines are available for taking out doing the main mortices and for the shallower ones for the plates a small router jig is ideal. The same router can also be used to do a lot of the main mortice and of course with a different jig it can be set up for recessing the hinges also. 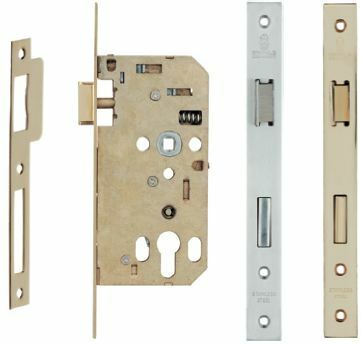 Mortise Lock : Image provided by Hafele Australia Pty. Ltd. Here is another lock that is a little more sophisticated than the previous one. As you can see it is deeper and incorporate a separate deadbolt and a non locking latch. The deadbolt protrusion is greater than the previous one. The photo shows two different forend finishes.